The massive 9.0 earthquake hit March 11th and wreaked havoc on the region including shaking up Japanese nuclear plants and causing cooling system failures and radiation leaks. Thousands had to evacuate the area as plant workers battled to stop the nuclear plants from causing even more damage to the region. 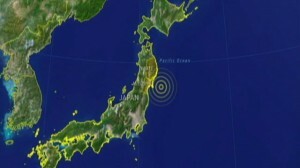 The fresh Japan earthquake hit at 9:57 a.m. local time. No major injuries or damages have been reported. The residents of coastal areas were evacuated for about two hours after the earthquake, but the tsunami warning has since been lifted. The earthquake’s epicenter was off the coast of Japan’s main island, Honshu, in the Pacific Ocean. There is no tsunami danger for the United States’ West Coast or Hawaii, according to officials. The spring of 2012 marks the 100th Anniversary of the National Cherry Blossom Festival. In 1912, the city of Tokyo, Japan gave Washington DC an incredible gift of 3,000 cherry blossom trees to be planted around the Tidal Basin in West Potomac Park, in East Potomac Park and on the grounds of the Washington Monument.